Delhi Chief Minister Arvind Kejriwal on Thursday asserted that Aam Aadmi Party (AAP) Government will succeed in cleaning the Yamuna River though it will take time. Kejriwal, who is currently on a visit to South Korea, made the assertion in reply to a tweet that raised the failure of urban rejuvenation projects in India and stalled plans for the Yamuna River front development. Kejriwal accused previous Governments of not cleaning the Yamuna River and not implementing the river front development projects. “Becoz then, AAP govt wasn’t there. Now, it will happen. As there have been concrete improvements in other spheres during AAP govt, we will work hard on cleaning drains and Yamuna. It will take time. Koreans did it in 27 months. But I am confident that we will succeed,” he tweeted. 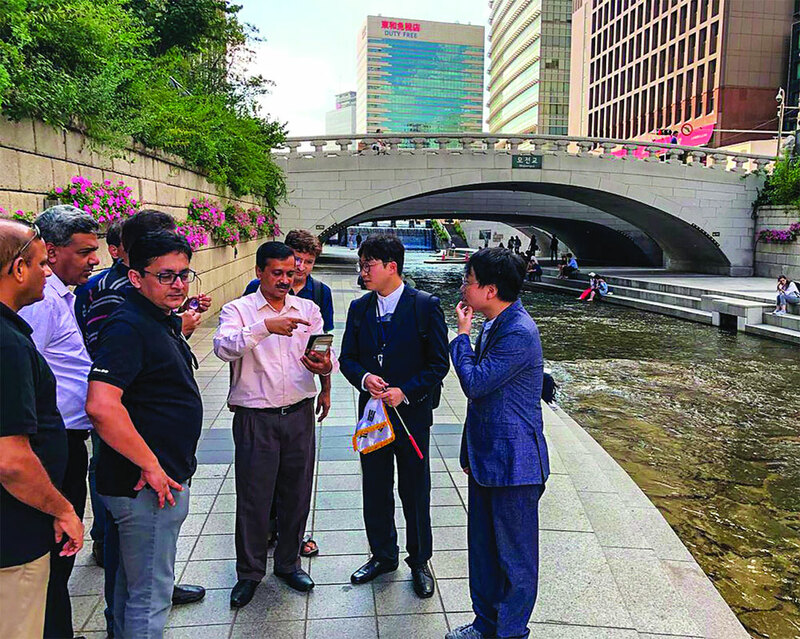 During his trip to South Korean capital Seoul, Kejriwal visited Cheonggyecheon stream that was transformed from a polluted water body to a popular tourist spot. “The Cheonggyecheon Restoration Project in Seoul, which I myself saw on Wednesday at the downtown, was centred on revitalising the stream that had been covered for decades by a highway overpass. The city of Seoul used its own resources to bring new life to the downtown by enhancing the urban environment. The restoration of the Cheonggyecheon Stream led to the revitalisation of central Seoul, unleashing the potential for green public space,” he said. “Residents of Delhi expect their provincial Government, currently headed by me, to solve all their problems. Expectations of the people are not without basis and it is the duty of any government elected by them to solve their problems. Urban Regeneration a very wide term and according to me, covers many crucial aspects,” said the CM. “Delhi’s waterscape heritage is unique as it has a continual natural water system and there is a huge potential for pedestrianisation and urban connections along these waterways. The aim is to channelise pedestrian movement within the city, using the existing waterways, greens, historic and transit features of the city in order to enhance connectivity within the urban fabric. The endeavour shall be to create a pedestrian-friendly city. “The challenge Delhi faces is that people from various parts of India have tendency to come to the Capital city in the hope of employment and a better future. This has led to unplanned urban sprawl and it is high time that this sprawl be revamped with a human face. Everybody has a right to lead life with dignity and therefore governments must ensure rights of people living in unplanned colonies,” Kejriwal added. Besides this, Delhi has developed as a seamless city with an urban continuum comprising of a number of rapidly growing towns in neighbouring States. This has added to the flow and movement of traffic within Delhi. Despite measures by way of increasing the length of the road network and road surface through widening, construction of a number of flyovers / grade separators and, launching of the Metro, the traffic congestion has continued to increase unabated, he said. “I have heard a lot about public transport of Seoul and the successful use of technology for public transport in Seoul is a talking point across the world. In Delhi, the Metro has emerged as a very successful mode of public transport over the last 15 years and it is known for its professionalism and efficiency. With the use of advanced IT, I am told detailed information on the massive Seoul traffic system can be collected in real-time and a remarkable amount of data can be gathered and analysed by the one centre of Seoul TOPIS ((Seoul Transport Operation and Information Services)”, Kejriwal said. “One of the biggest challenges currently faced by Delhi and its adjoining areas is air pollution. Latest studies show that more than 70 per cent air pollution in Delhi is caused by factors for which Delhi itself is not responsible,” he further said. “Delhi also faces a serious solid waste management challenge. I will be happy to suggest the civic bodies of Delhi to learn the Seoul model of disposal and management of solid waste. Delhi is also seriously working on water conservation and management, since in summer months Delhi faces a scarcity of water, due to the fact that our capital city is dependent on neighbouring States for water, since it does not have any water sources of its own,” the CM concluded.